Vanguard dances around aboard his spaceship but his fun is interrupted when an alarm klaxon sounds. Before he can investigate the source of this alert his vessel begins to shake and he is knocked over and is knocked out when his head hits some equipment. Wally attempts to contact his partner to warn him that a massive alien vessel is approaching Earth. It opens fire and cripples Vanguard’s craft which enables it to land on Earth unmolested. The occupants of this vessel are the Cosmic Cops and they touch down in Central Park which kills numerous people. It then erects a barrier around it to seal off a section of New York City before the atmosphere is changed and kills almost everyone inside this dome. Any survivors are collected up and brought inside the Cosmic Cops’ headquarters. At the Pentagon, Jake Farrell speaks with someone about the Covenant of the Sword, wanting the government to show some courage with taking the organization on. His phone call is cut short when he is informed of the arrival of the Cosmic Cops. Jake is taken in a helicopter to survey some of the damage and it is explained that any aircraft that gets too close to the city gets shot down. He is played a message sent out by the aliens warning away any intervention by the military or any super-teams. Jake is concerned that a team called Brute Force is mentioned as they are only just getting recruited at the moment. The Cosmic Cops vow to set up other precincts across the globe to transform the Earth into a law-abiding planet. 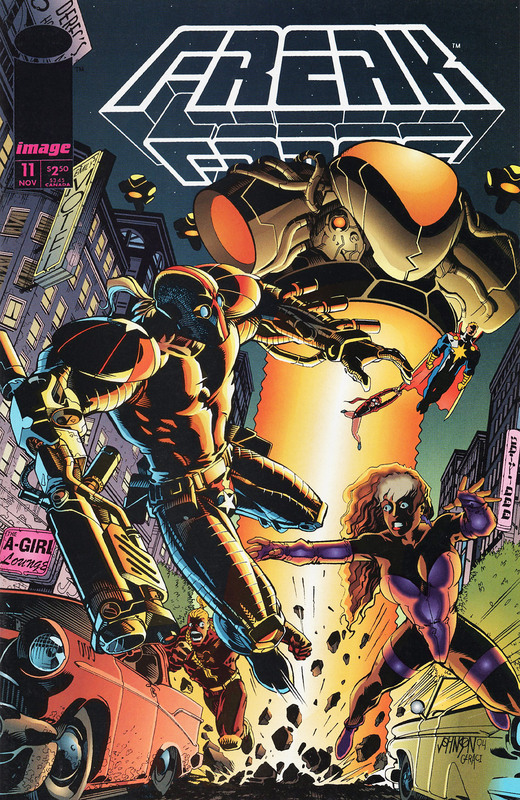 Freak Force is not amongst the list of super-teams being monitored in case of hostile action against them. Jake is uncomfortable seeking out the aid of Freak Force as it would confirm that he has had dealings with them in the past when their relationship should be secret. Over in Chicago, SuperPatriot bursts out onto the streets after a training session within Freak Force’s headquarters goes wrong. Barbaric had convinced Dart to have a training room installed after being inspired by a superhero cartoon. Rapture comments on the decision to build this facility which causes Dart to react badly, feeling the pressure of leadership. Jake Farrell arrives to speak with the team and sends Chelsea Nirvana away as he does not see that she should be present during his briefing.